The World Of Art and Artists Explored In N-Varod! Nursery Varod has been immersed in a unit on different artists and their famous works of art. In order to help the children connect to this topic, the teachers read the book The Artist Who Painted a Blue Horse by Eric Carle. This book explains that a person can paint or draw an object in any color! The children were also introduced to the artist Vincent Van Gogh. They looked through many books to become familiar with his style of painting. They learned how he began painting using black and white paint. They noticed from the pictures that he was able to show people as sad or happy by their facial expressions. The children experimented with creating their own shades of grey from black and white paint. Some children used white chalk and colored on black paper hung on the walls. Later on in his life, Van Gogh discovered how vibrant colors and swirly lines created rich paintings. Students looked at many of his famous pictures such as "Sunflowers" and "Starry Night." In small groups, the students were given shoe boxes with sand in them and made swirls in the sand to practice the motion. After the sand art, students were then given paint and large paintbrushes to paint freely. Later, they also added sand as texture to the paint for added dimension. The children also used different tools to paint with to create different designs. In addition, teachers covered the walls with butcher block paper so the children could color and paint freely and collaboratively during choice time. Later on, while learning about Piet Mondrian, the children worked with colored tape and paper to express themselves in the way that Mondrian did. 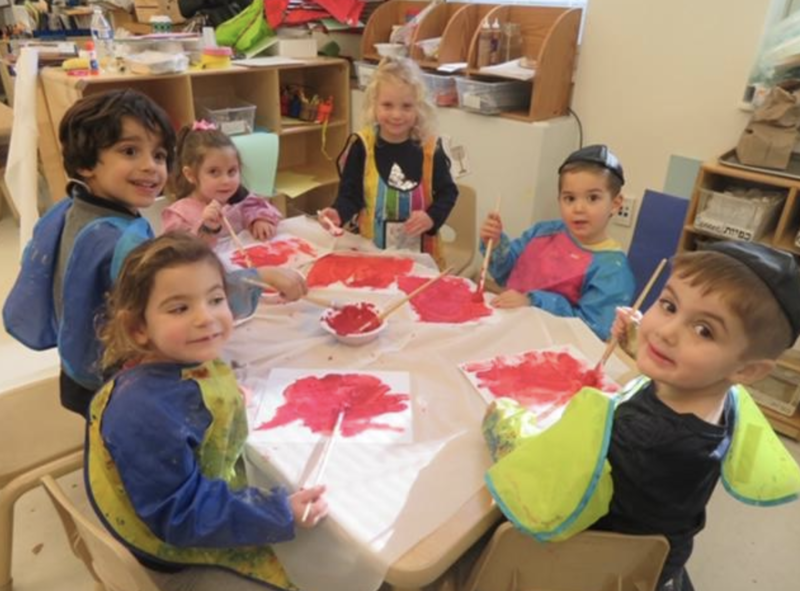 Throughout the last few weeks, there were many open ended painting activities using a variety of brushes, tools and textures with large butcher paper on the tables and walls. Some children worked together and others chose to make individual pictures. Students also learned about George Seurat, who painted using pointillism. The children experimented with this technique in a variety of ways. Some children used the pointed edge of a brush. Other children experimented using Q-tips. We also used our familiar dot paints to create designs like this artist. Additionally, the children also mixed paint to make their own colors, listened to music and were inspired to paint like Wassily Kandinsky, and splatter painted like Jackson Pollack!